McKinsey and Company – will The Firm win DIGITAL? A blog post discussing McKinsey and Co. and the race to adapt to the digital revolution and keep leading the management consulting industry. McKinsey & Company is an international management consulting firm, arguably the biggest one in its space, spans over 60 countries and 120 cities. Within the +200 Billion management consulting industry, the company commands the largest market share with an estimated 4%. The firm is a privately owned partnership and has been estimated by Gartner and Vault to generate approximately $8-9 Billion, with about 23K employees worldwide. 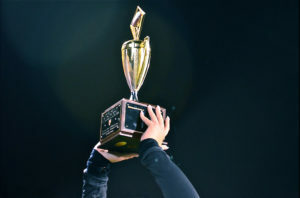 McKinsey & Co.’s biggest traditional competitors in the management consulting market have traditionally included: Deloitte, Accenture, BCG and Bain & Company, but in today’s world, McKinsey & Co., the company dubbed by many – ‘The Firm,’ would be over simplifying if it were to ignore the wave of new competitors. Today, there are many other services with competing offerings that McKinsey & Co.’s clients, e.g., Fortune 500s, can seek help from with their business and management problems. Some of these new players include: market place platforms like UpWork or Catalant, local or niche consulting firms such as CBRE, which specializes in real estate advisory services and even design thinking firms such as IDEO. While these add to the competitive intensity traditional management consulting firms such as McKinsey & Co. face, arguably one of the biggest shifts in the space, has been the digital revolution and the emergence of information technology at its foundation. These days, historically satisfied McKinsey & Co. clients, are looking for more. For example, they’re looking for more precise analysis of ‘big data’, advanced analytics and machine learning capabilities, rapid prototyping skills, digital user experience expertise and lots more. Clients are looking for partners who can help their businesses make the ‘digital leap’ to serve new generations of customers: Gen X, Gen Y, millennials, and even Gen Z. This tectonic shift in how busiensses seek out help with their biggest problems means that companies like IBM, Microsoft, GE and also smaller upcoming analtics and digital tools companies are now competing for share of wallet of Fortune 500s and Fortune 1000s. But does the firm have what it takes to take on this challenge? Leaders at the firm have recognized that the resources, investments & talent it had in the past will not suffice to lead them into the future. In this new reality, McKinsey & Co. is faced with decisions on how to incentivize and hire software and hardware engineers, product managers, digital transformation experts and many more. They compete not only with their management consulting peer firms but with some of the world’s most attractive companies, e.g., Google, Amazon and Microsoft, not to mention fast growing exciting startups with compelling equity upside propositions. To be clear, over its 92 year history McKinsey & Co. has been well accustomed to ever-changing competitive landscape and adjusting client needs, but the question remains — how well and how fast can the firm react to this digital revolution? Considering the core business model through which the firm generates revenue, the digital revolution clients and markets are facing is not in and of itself a bad business reality for McKinsey & Co. At its core, it is an opportunity. The current revenue model attempts to answer clients’ problems and questions with projects, named “studies,” ranging in duration from 1 to 18 months, which usually assemble a dedicated team on the ground backed by the firm-wide resources and knowledge to deliver an impactful response, strategy and implementation plan. Different studies fit under the 12 different functional groups, e.g., Risk, Marketing & Sales or Implementation and the recently added function – “Digital McKinsey”. If you assume clients are still facing traditional business questions with an added a digital complexity, then this means McKinsey & Co. benefits from more possible scenarios in which its services are needed. Layered on top of that is the fact that this functional need has permeated into almost all industries, e.g., Banking, Oil & Gas , etc. This means the McKinsey & Co. offering matrix, (i.e., industries across functions), can grow in both axes. 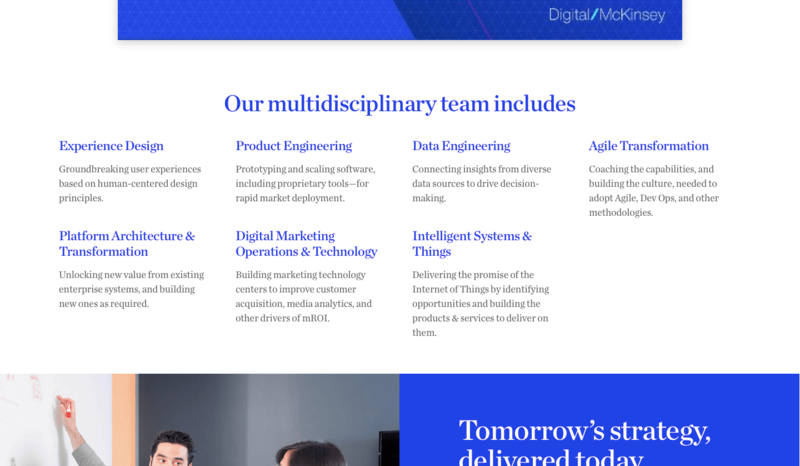 McKinsey Digital, the 12th firm functional expertise, was launched recently. Example studies include teams helping clients with: “Digital strategies, Building digital cultures, Creating digital experiences” and many more. McKinsey Digital Labs, (MDL), is aimed to help clients capture new digital value from: “New ideas, new products and new systems…’ This organization was rumored to have recently surpassed +1,000 employees worldwide. Bold Acquisitions include the acquisition of Lunar, the product design and development consulting company in an attempt to better position McKinsey & Co. as a world leading product development advisory firm. Another example is the 2015 acquisition of QuantumBlack, a London based Big data and advanced analytics house. New Partnerships include McKinsey Analytics partnering with SparkBeyond, a startup focusing on finding complex patterns in data powered by a proprietary AI research engine. McKinsey & Co. could deploy this partnership with clients through an added layer of service to existing studies. WINNING the DIGITAL race, is MCK DOING enough? In my humble opinion, I think McKinsey & Co. needs to consider making more aggressive changes to break away from industry and adjacent industries competitors. Firstly, the firm should consider adapting the organization to its changing workforce and the way that talent would like to work. McKinsey & Co. fosters and promotes a meritocracy, (see the company’s full list of 15 values). As such, the company’s management consultants have traditionally been promoted by performance and measurable client impact, via consistent review committees ensuring an “Up-Or-Out” pyramid. While this is the core path to achieve firm partnership for CSS, (Client Service Staff), the firm has laid out new tracks for CSSA, (Client Service Staff Assistants), and for the new digital talent pool as well. While on paper this makes sense, most of the firm’s high performing and highly driven management consultants might disagree. When you have different KPIs for impact and different career paths with different inherent employee expectations, including working hours, workload intensity and even required travel, those could be a recipe for disaster. McKinsey & Co. is a privately owned partnership and as such I do not believe the right move here is to spin off the Digital efforts of the firm into a separate company. However, a more drastic rethinking should be undertaken on what is offered to each of the talent pools, presumably, each with a different goals and career aspirations. The bottom line is: Should a software engineer coding a mobile banking app be measured, incentivized and promoted to firm partner similarly to a client facing management consultant? Historically, the firm has charged fixed fees from clients for scoped studies to answer their business questions in predetermined timeframes. With time, the firm has adopted a mix of fixed payments combined with a “fees-at-risk” model, but has tried to stay away from a pure outcomes based model, (i.e., 100% fees-at-risk). I believe that as the firm starts competing with non management consulting firms, (see review of changing competitive landscape above), there will be lots of players like digital health startups, digital advertising and digital marketing firms and even product development companies to name a few that will have a very different risk tolerance. This may be enticing for clients and in my opinion McKinsey & Co. should consider a pure outcomes based fee model for some of its digital undertakings. In this “digital race” there is no doubt McKinsey & Co. has had some bright minds thinking seriously about the firm’s past and future, not afraid to make bold moves like set up new business lines, carve out new organizations within the firm and proactively source new talent pools with different incentives and career paths. However, in my humble opinion, the firm is also known to be quite risk averse, as perhaps is usually the case with market leaders, but in times of revolutions, with potentially big swings of power between competitors on the horizon, can the firm truly live with the risk of playing it safe? 2. Eisenmann, Thomas, Jeffrey F. Rayport, and Christine Snively. “Catalant: The Future of Work?” Harvard Business School Case 817-103, March 2017. Very interesting topic! Since almost every firm across different industries will be affected by digital transformation, I wonder if the organizational structure of the firm should change. Rather than having a “Digital McKinsey” function within the firm, it might be more effective if these digital capabilities and experts are absorbed into the existing industry and function groups. As VR and AR capabilities become more widespread for example, the difference between the physical and digital world will also diminish. Therefore, having digital capabilities within all of McKinsey’s functions across industries may actually be more reflective of the state of reality that the clients are in. Of course, this is not easy, as both you and Saurav have pointed out the potential cultural resistance within the firm and differences in talent and personalities between the digital experts and management consultants. However, I think this integration is necessary if McKinsey needs to prove its expertise in the digital space. Not only do they need to show that they can help clients’ through their digital transformation, they also need to transform themselves into a digitally savvy organization. 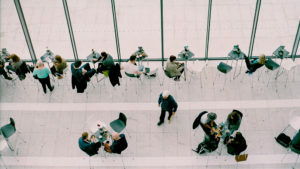 This means that the incentive structure and work culture might have to change across the entire organization in order to promote collaboration between the digital and non-digital teams. Instead of having separate KPIs, it might make sense for McKinsey to have the same KPIs and promote cross-functional training so that consultants become more knowledgeable in the digital space while the data scientists and computer programmers become more aware of the business implications of the digital implementations. Thanks for sharing this post! I think you highlighted some extremely relevant issues, and I think your insights on the measurement and promotion of human capital and the changing of its revenue model was spot on. In addition to expanding its expertise and offerings in digital, I am curious if “the Firm” is concerned about other issues brought on by digital, such as the commoditization of knowledge, crowdsourcing, consulting platforms, and artificial intelligence. Hopefully, McKinsey’s strong brand and reputation of “no one gets fired for hiring McKinsey” will sustain it in the short term, buying it enough time to make a digital transformation of its own. Exciting changes happening in consulting! I also wonder how the move to digital and faster business models for the firm’s clients affects when and how McKinsey can most effectively support them. As BCG moves more into co-founding and co-investing in tech products and companies with clients as part of Digital Ventures, McKinsey is shifting towards more work that blurs the line between consultant and operator (especially in the Recovery and Transformation Services/RTS practice). That kind of work also likely has an impact on what kind of talent is needed, fee structure, and promotion paths to partner.